Go, team, go! A swim meet is the focus of the episode "Je Suis Une Amie." Take a deep breath, Emily! You may be under that water for awhile. Toby is a master at giving someone a creepy point. Consider this a great example. The girls are gathered for a swim meet in this photo. They are there to cheer on Emily. Emily approaches teammate Paige in this scene. They are at the center of an episode that focuses on a school swim meet. 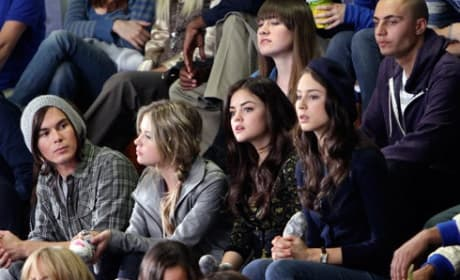 Pretty Little Liars Round Table: "Je Suis Une Amie"